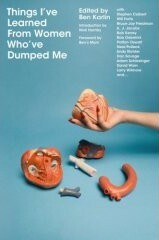 Tonight at the main branch of the New York Public Library, Ben Karlin, the former “Daily Show” producer and editor of the new anthology “Things I’ve Learned from Women Who’ve Dumped Me,” will talk with contributors like the comedian/animated character Patton Oswalt, the veteran stunt-author A. J. Jacobs, the indie filmmaker David Wain and Todd Hanson the head writer for “The Onion.” Listen to what they say; do the opposite. (Except for Fountains of Wayne, who will also perform; they’re probably safe.) [UrbanEye]. Ben is also taking his crew to the UCB for four encore presentations of “Things I’ve Learned from Women Who’ve Dumped Me” on Feb 7, 13, 21 and 28. Check the UCB schedule for each night’s special guests.